Job Categories: Gulf Jobs Demand. Job Types: Contract. 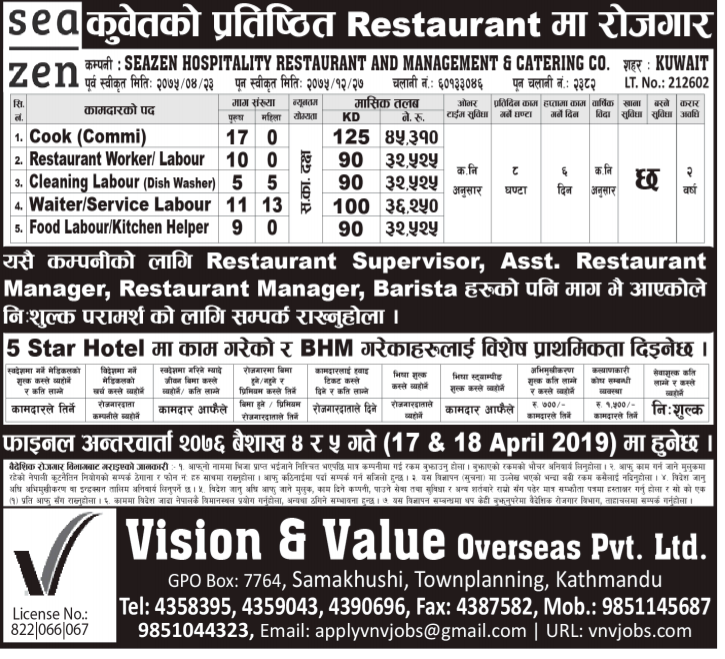 Job Tags: EJOBS, Ejobs Nepal, ejobsnepal, HAMRO JOB, jagire, Job Demand From Kuwait, job vacancy, Job Vacancy For Cook, JOB VACANCY FOR VARIOUS POSITION, Job Vacancy In SEAZEN HOSPITALITY RESTAURANT AND MANAGEMENT AND CATERING CO, Jobs in Kathmandu, jobs in nepal, mero job, mero rojgari, Merorojgari, Nepal, Nepali Jobs, nepalijobs, timro job, and wanted. Salaries: 40,000 - 60,000.